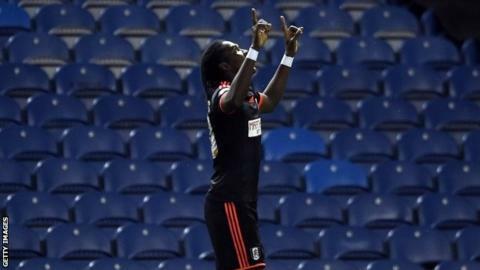 Hugo Rodallega scored the only goal as Fulham beat Leeds to overtake them in the Championship table. Lasse Vigen Christensen pulled the ball back for the Colombian to fire home the only goal on the hour mark. Leeds had a fantastic chance to level when Fulham keeper Gabor Kiraly missed Billy Sharp's cross but Adryan headed wide. Rodallega had a chance to seal the game when he was through on goal but failed to hit the target. The result takes Fulham up to 14th in the table, while Leeds drop to 19th. Both clubs have changed manager in a disappointing season, with Leeds - whose owner Massimo Cellino could step down from the board - on their third boss. But Leeds entered the match in better form having won their last two home games. Fulham had only won one of their last six away games, with their most recent game a 5-0 home defeat by Watford. And their first meeting since a Premier League clash in March 2004, over a decade ago, had extra spice with Ross McCormack - who left Leeds for £11m in the summer - being named Fulham captain. The major chance of the first half came when Leeds midfielder Alex Mowatt's header from Sam Bryam's cross hit the crossbar and then went out of play off Kiraly, who was playing because of Marcus Bettinelli's suspension. McCormack had Fulham's best opportunity of the opening period but he lost his footing chasing a long ball when it looked as if he was through on goal. Fulham improved after the break and their goal came when Christensen chested the ball, slipped past Tommaso Bianchi and set up Rodallega to fire home from six yards out. Adryan and Rodallega missed their chances after the goal and in an added concern for Leeds, defender Stephen Warnock came off with a hamstring injury in the closing minutes. Leeds manager Neil Redfearn: "I'm disappointed with the result and for the first time today, at home, we lacked that conviction and that devil. "I thought our passing was a little bit tatty and we left ourselves open on the counter-attack. "We got ourselves to that stage where we had some momentum at home but I thought we looked tentative in and around the box; the final pass didn't quite happen and when it did we didn't have someone in the box." Fulham manager Kit Symons: "Confidence is a huge thing in football, especially with strikers more than anyone. Hugo (Rodallega) is really enjoying his football, he's a lovely lad, he wears his heart on his sleeve and he needs to be happy and loved. He's all that at Fulham and we are loving him scoring the goals for us." "Leeds have a great home record under Neil (Redfearn), (we) knew it would be a tough game and I'm delighted with the result." Match ends, Leeds United 0, Fulham 1. Second Half ends, Leeds United 0, Fulham 1. Foul by Tommaso Bianchi (Leeds United). Elsad Zverotic (Fulham) wins a free kick in the attacking half. Substitution, Leeds United. Gaetano Berardi replaces Stephen Warnock because of an injury. Substitution, Fulham. Elsad Zverotic replaces Seko Fofana. Offside, Fulham. Ross McCormack tries a through ball, but Cauley Woodrow is caught offside. Billy Sharp (Leeds United) wins a free kick on the right wing. Corner, Fulham. Conceded by Liam Cooper. Corner, Fulham. Conceded by Jason Pearce. Attempt missed. Hugo Rodallega (Fulham) left footed shot from the centre of the box is close, but misses to the left. Assisted by Lasse Vigen Christensen. Substitution, Leeds United. Chris Dawson replaces Adryan. Attempt blocked. Mirco Antenucci (Leeds United) right footed shot from the centre of the box is blocked. Assisted by Liam Cooper. Corner, Leeds United. Conceded by Konstantinos Stafylidis. Attempt saved. Hugo Rodallega (Fulham) header from the centre of the box is saved in the centre of the goal. Assisted by Ross McCormack with a cross. Attempt missed. Billy Sharp (Leeds United) right footed shot from outside the box misses to the right. Assisted by Stephen Warnock. Corner, Leeds United. Conceded by Nikolay Bodurov. Attempt blocked. Billy Sharp (Leeds United) header from the centre of the box is blocked. Assisted by Alex Mowatt with a cross. Attempt saved. Adryan (Leeds United) left footed shot from outside the box is saved in the centre of the goal. Assisted by Alex Mowatt. Stephen Warnock (Leeds United) wins a free kick on the left wing. Goal! Leeds United 0, Fulham 1. Hugo Rodallega (Fulham) right footed shot from the centre of the box to the bottom right corner. Assisted by Lasse Vigen Christensen. Attempt saved. Adryan (Leeds United) right footed shot from long range on the left is saved in the centre of the goal. Attempt missed. Tommaso Bianchi (Leeds United) left footed shot from outside the box misses to the right. Attempt blocked. Alex Mowatt (Leeds United) left footed shot from the left side of the box is blocked. Assisted by Stephen Warnock.